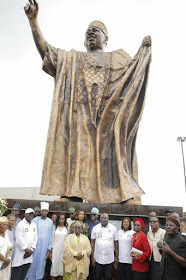 Lagos State Governor, Akinwunmi Ambode on Tuesday, unveiled a 46-feet statue of Nigeria’s symbol of democracy and adjudged winner of the June 12, 1993 Presidential Election, the late Chief MKO Abiola, expressing optimism that the monument will forever crystallize what he stood for in his lifetime. Governor Ambode, who spoke at the unveiling of the statue at the MKO Abiola Garden in Alapere, Ketu said it was in the tradition of the State Government to recognise and remember heroes and heroines who contributed to the greatness of the nation and the State in particular, adding that MKO Abiola deserves the best from the State as Lagos was his success story. 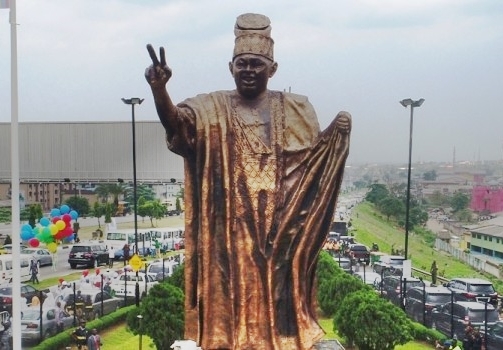 Alluding to the fact that a statue was previously sited at the location, the Governor said that his administration decided to erect bigger statues for MKO Abiola and late Rights Activist, Chief Gani Fawehinmi to properly situate their immense contribution to nation building. 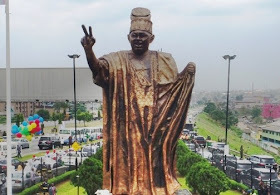 “There was a statue done by my predecessor, Babatunde Raji Fashola but in the divine world, some things are more glorious than what you think and so we decided at the end of 2016 that we should do bigger statues for Chief Gani Fawehinmi and MKO Abiola since almost everybody passing and entering Lagos go through this particular Ojota axis and so we started late in 2016 that we should build something bigger and so it took us about a year to do this. By the time we did the one for Gani to celebrate his posthumous birthday on April 22, we also agreed that we should unveil that of MKO Abiola today, June 12..."